NEW YORK (Reuters) - Major world equity markets fell on Monday and the dollar slipped against the safe-haven yen after new U.S. immigration curbs stirred concerns about the impact of U.S. President Donald Trump's policies on global trade and the economy. Stocks posted their worse day so far this year on Wall Street after Trump's executive order on Friday, to bar Syrian refugees and suspend travel to the United States from seven countries, put the spotlight back on his protectionist bent. The dollar fell against the yen as investors sought the traditional security of the Japanese currency, and gold edged higher amid heightened political uncertainty. Gold futures rose 0.4 percent to settle at $1,193.20 an ounce, while the dollar slipped 1.18 percent to 113.70 yen. The negative reaction to Trump's orders cooled a rally that had lifted U.S. equities to a series of record highs following the president's election in November, encouraged by promises of tax cuts and simpler regulations. However, the potential risk from some of Trump's policies have dampened enthusiasm. The CBOE Volatility index, known as Wall Street's "fear gauge," rose 1.32 points to 11.90 from multi-year lows. Investor enthusiasm over expectations of a pro-business Trump agenda, especially tax and regulatory reforms, had spurred the rally, said Rick Meckler, president of hedge fund LibertyView Capital Management LLC in Jersey City, New Jersey. "These two things were most important," Meckler said. "We seem totally caught up now in immigration reform and travel restrictions. Those are not things the business community is necessarily excited about." Peter Cardillo, chief market economist at First Standard Financial in New York, said that investors had focused on Trump's pro-growth of proposals and ignored anything detrimental to economic activity, such as protectionism. MSCI's all-country world stock index fell 0.62 percent, while the FTSEurofirst 300 Index of leading pan-European stocks closed down 1.06 percent. Country indexes for Germany, France, Italy and Spain all fell by more than 1 percent. Shares on Wall Street also fell about 1 percent but pared some of their losses late in the session. 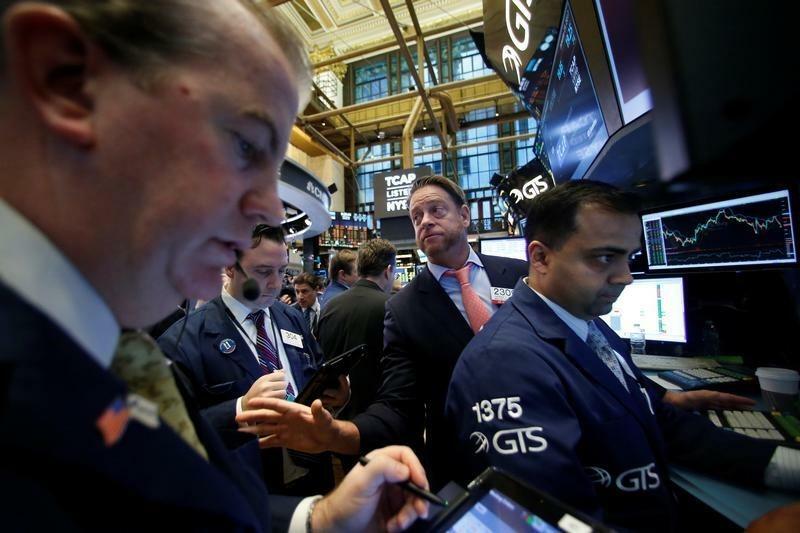 The Dow Jones Industrial Average closed down 122.65 points, or 0.61 percent, to 19,971.13. The S&P 500 lost 13.79 points, or 0.60 percent, to 2,280.9 and the Nasdaq Composite slid 47.07 points, or 0.83 percent, to 5,613.71. Earlier in Asia, Japan's Nikkei fell 0.5 percent and Australian shares slid 0.9 percent. The euro fell to an 11-day low against the dollar after the release of German inflation data that was slightly weaker than expected. But the euro steadied as investors reassessed consumer prices hitting the highest in three-and-a-half years. The euro was unchanged at $1.0694. U.S. Treasuries were little changed ahead of policy meetings of the U.S. Federal Reserve on Tuesday and Wednesday and a heavy week of data that culminates with Friday’s jobs report for January. The Benchmark 10-year U.S. Treasury note was down 4/32 in price to yield 2.4956 percent. Germany's 10-year yields dipped as low as 0.436 percent on the inflation number. Oil prices fell as news of another weekly increase in U.S. drilling activity spread concern over rising output, just as many of the world's oil producers attempt to comply with a deal to pump less to try to prop up prices. The number of active U.S. oil rigs rose to the highest since November 2015 last week, according to Baker Hughes data, showing drillers are taking advantage of oil prices above $50 a barrel. Global benchmark Brent crude oil prices were down 23 cents at $55.29 a barrel, while U.S. crude futures settled down 54 cents at $52.63.